Kodokushi: In aging Japan, thousands die alone and unnoticed every year. Their bodies often go unnoticed for weeks. The entrance to Haruki Watanabe’s apartment, as workers make progress with cleaning up the space. 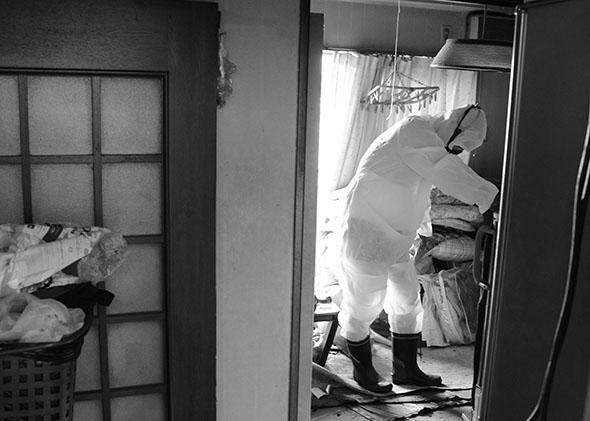 Three months ago in an apartment on the outskirts of Osaka, Japan, Haruki Watanabe died alone. For weeks his body slowly decomposed, slouched in its own fluids and surrounded by fetid, fortnight-old food. He died of self-neglect, solitude, and a suspected heart problem. At 60, Watanabe, wasn’t old, nor was he especially poor. He had no friends, no job, no wife, and no concerned children. His son hadn’t spoken to him in years, nor did he want to again. Disgusted, angry, but mostly shocked that this could happen to him, the landlord rung the police. The police came; they investigated with procedural dispassion and declared the death unsuspicious. This wasn’t suicide in the traditional sense, they said, but it did seem that the deceased had wanted to die. They’d seen it before, and it was an increasingly common occurrence throughout Japan: a single man dying, essentially, from loneliness. They noted down what was required by their forms, wrapped up the body in officialdom, tied it with red tape, and removed it amid gawps and gags of inquisitive neighbors. The police then departed for the cemetery, where, because no family member had stepped forward to claim the body, they would inter Watanabe in an unmarked grave alongside the rest of Japan’s forgotten dead. 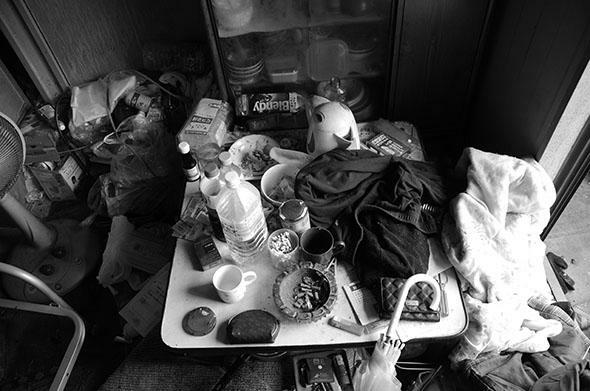 A table full of Haruki Watanabe’s possessions, cigarettes, and half-eaten food. Suzuki was now left to his festering property and precarious financials. He was concerned. He didn’t know who to call or how to deal with the situation. In Japan, suicide can dramatically reduce the value of a property, and although this wasn’t suicide, his neighbors had seen enough; the gossip would spread fast. He heard whispers of kodokushi, a word bandied about since the Great Hanshin earthquake in 1995, when thousands of elderly Japanese were relocated to different residences and started dying alone, ostracized or isolated from family and friends. But what did that really mean for Suzuki, and how was he going to deal with it? Like most Japanese, he had heard of the “lonely death” but had not really believed in it; he certainly didn’t know what to do in such circumstances. So he turned to the Internet, and after hours of fruitless searching found a company called Risk-Benefit, run by a man named Toru Koremura. With no other options he picked up the phone and gave the company a call. Short, with the shaven head of a Zen monk, Koremura is 32 years old but has the soft, elastic features of a much younger man. He wears baggy white overalls that drown his frame and a shy smile that speaks of his diffidence. Seated in his messy van he is on the way to Haruki Watanabe’s apartment. While he drives he talks deliberately, with the meticulous cadence of a metronome and the pitch of a radio broadcaster. His epiphany came when his current partner told him how she had lost her grandmother. Unlike Koremura’s loss, her grandmother had died alone—a kodokushi. It was seeing the deep regret in her, and accepting his own ennui, that made Koremura finally take action. 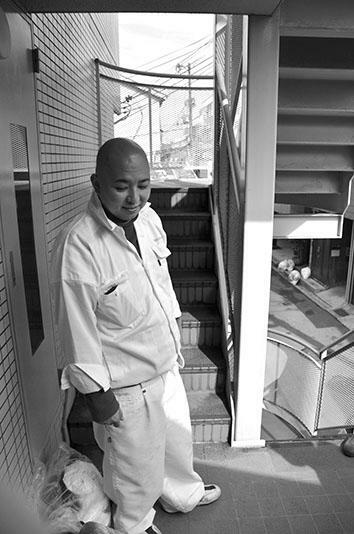 He left his job as a stockbroker and set up his own removal company dedicated to the cleanup of kodokushi victims. He wanted to give something back to the generation of his grandmother, and he also wanted to change who he was. “I was ready for the prospect of change, but looking back, perhaps I wasn’t quite so ready for how different my life was to become,” he remembers. 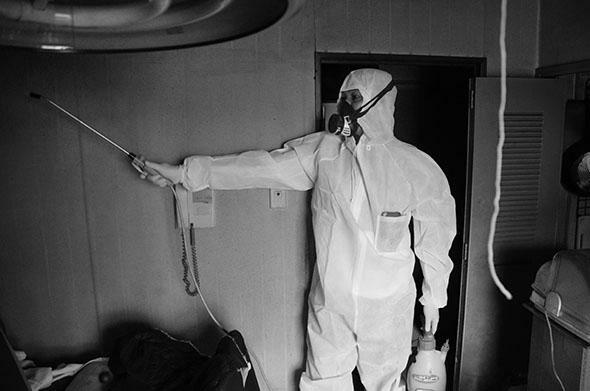 One of Toru Koremura’s workers sprays the room with an insecticide. 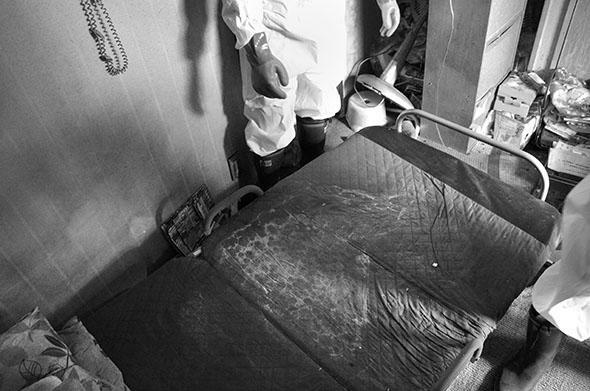 The bed on which Haruki Watanabe died. The white stain of dried-up bodily fluids outlines the man’s body. Down at street level the rest of the neighborhood carries on as normal, oblivious to what’s going on inside Haruki Watanabe’s home. Vendors sell, delivery men deliver, taxi drivers pick up and drop off, children laugh and play—and all the while workers dressed in surgical masks carry out the last of Haruki Watanabe’s mortal remains. The Confederate flag doesn’t belong in a museum. What the emphatic health care win means for Obama’s legacy.